(from UPI by Clyde Hughes, with Reuters) — Many European countries have followed the lead of the United States and recognized Venezuelan opposition leader Juan Guaido as Venezuela’s new leader. Britain, Spain, France, Germany, Austria and Denmark all announced they recognize Guaido as the country’s president, which came after embattled Venezuelan President Nicolas Maduro rejected calls for new elections. The Czech Republic, Estonia, Germany, Poland, Portugal, and Sweden, as well as Israel, Australia, and Canada also sided with the United States to recognize Guaido. 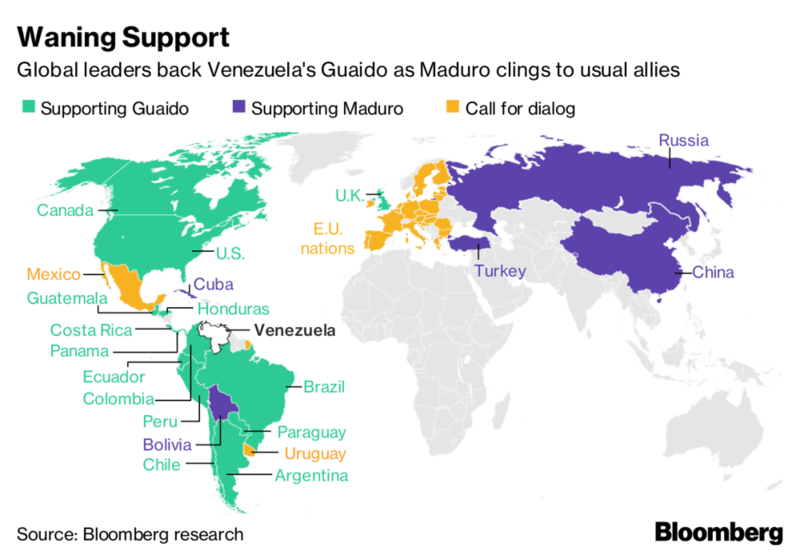 In Central and South America, the majority of nations, are backing Guaido. Brazil, Argentina, Chile, Peru, Colombia, Paraguay, Ecuador, Guatemala, Costa Rica, Honduras, and Panama have all announced their support for the interim leader. In addition, the newly elected left-leaning president of Mexico, [the leftist governments of] El Salvador, Nicaragua, Bolivia, and [the Communist government of] Cuba sided with Maduro. Russia and China have, which have poured billions of dollars of investment and loans into Venezuela, are both supporting Maduro. The Maduro government is paying off both countries’ loans with oil. [Following the weekend announcements] Russia slammed the moves to recognize Guaido, saying they interfere in Venezuelan internal politics. Canadian Prime Minister Justin Trudeau said he spoke with Guaido Sunday in a show of support while the United States said military action is an option. Maduro has slammed efforts to remove him as coup attempts. Russia and China have reiterated support for his presidency, along with Bolivia, Cuba, Iran, Nicaragua, Syria and Turkey. Guaido has courted officials in both Moscow and Beijing in an effort to sway the two powers to his side. From UPI on Feb. 4 with Reuters. Reprinted here for educational purposes only. May not be reproduced on other websites without permission.